This post is in response to readers asking me to cover the topic of induction for low amniotic fluid volume (AFV). Most of the content is available in textbooks, in particular Coad and Dunstall 2011 and Beall and Ross (2011), and I have provided references/links for research where I have stepped outside the textbook sources. I use the word ‘may’ quite a bit in this post because little is known about AFV, therefore a lot of the available information is theoretical. In fact, this post probably raises more questions than answers! Also note that I am focussing on AFV at term. The balancing act required to maintain a healthy AFV may be influenced by hormones (prolactin and prostaglandins), osmotic and hydrostatic forces, and the baby. Maternal hydration is also associated with AFV (Patrielli et al. 2012). From day to day there is little change in AFV, however volume decreases towards term. This is normal. Perhaps this reduction reflects reduced lung secretions as the baby nears birth? The amniotic sac and fluid play an important role during pregnancy and birth – you can read more about that in an earlier post. Abnormalities in AFV occur when there is an imbalance between fluid production and clearance. Too much fluid is called ‘polyhydramnios’ and too little fluid is called ‘oligohydramnios’. However, measurement and thresholds of normal/abnormal are not clear. Measurement of AFV by AFI or ‘maximum pool’ is part of the Biophysical Profile assessment which aims to identifying babies with inadequate oxygenation via the placenta. However, it is unclear whether there is any benefit to this test. Indeed, an umbilical artery doppler test may provide a better assessment of placental function, and therefore how well oxygenated the baby is (Alfirevic, Stampalija & Gyte 2010) – which is what everyone is worried about. Oligohydramnios: baby is very easy to feel – in some cases you can see limbs; the uterus is smaller than expected; the mother may notice reduced movements. Polyhydramnios: baby is difficult to palpate and floats away as you apply pressure; the uterus is bigger than expected; the baby’s heart rate may sound muffled; the mother may notice breathlessness, vulval varicosities, oedema and gastric problems. When you are working as a midwife in a continuity of care situation you get familiar with the individual woman’s bump over time, and it is easier to notice changes. Measuring (with a tape measure) is often used to assess uterine growth – particularly when care is spread between a number of practitioners. Whilst measuring can assist with identifying polyhydramnios, it is unreliable in identifying oligohydramnios (Freire et al. 2013). Here is the second problem… there is currently no agreement about what constitutes ‘high’ or ‘low’ levels of AFV. Megann et al. (2011) conclude that: ‘high and low levels [of amniotic fluid] have yet to be established in the literature and are difficult to directly link to adverse pregnancy outcomes.’ So we are busy finding measurements that we don’t really understand the implications of? Most of the time there is no known cause for the ‘high’ or ‘low’ volume of fluid, and there is are complications caused by it. However, there are some factors worth considering if you are labelled with oligohydramnios or polyhydramnios. 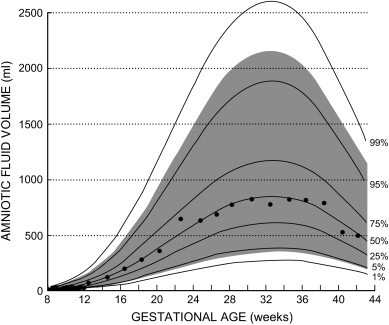 The normal physiological changes that occur to AFV as term approaches (see chart above) and/or the ‘normal’ level for the individual mother/baby is comparatively low to the general ‘norm’. Women having routine scans for ‘post-dates’ which then identifies this normal ‘low’ AFV. A recent review of the literature (Rossi & Prefumo 2013) found that in term or post-term pregnancies oligohydramnios (with an otherwise healthy pregnancy/baby) was not associated with poor outcomes. However, it was associated with increased risk of obstetric interventions… probably because the diagnosis leads to intervention. Pathological oligohydramnios is generally a consequence of reduced urine output (baby) which can indicate a redirection of blood flow away from the kidneys to the vital organs in response to reduced oxygenation. This usually occurs alongside pregnancy complications such as pre-eclampsia. In this case the low fluid volume indicates inadequate placental circulation to the baby. These babies often have significantly low AFV (easily identified by palpation), and are often growth restricted i.e. small and with limited glycogen supplies. These babies are at significant risk and further assessment and intervention should be offered. As a midwife there are few things more concerning than being able to see baby’s form though their mother’s abdomen. Induction of labour is the usual management for oligohydramnios (regardless of type) because there is concern that the baby has inadequate placental circulation (which is correct in relation to pathological oligohydramnios). However, women need to consider that the induction procedure is associated with reducing placental circulation and causing hypoxia and fetal distress. In addition, if the baby is post-dates he may have already passed meconium, and/or will if he becomes hypoxic due to the induction process. Oligohydramnios = less fluid to dilute the meconium = increased risk of meconium aspiration. Therefore, it is very likely that the baby will become distressed during labour before birth occurs. This is why electronic fetal monitoring is important – in clinical practice I saw the inevitable fetal distress and rush to theatre resulting from induction for oligohydramnios over and over again. So, the mother must be prepared for, and informed of the likelihood of c-section. The other alternatives are planned c-section or awaiting spontaneous labour. Whilst spontaneous labour is more gentle on the baby than an induction, waiting for labour with a baby who is not being well supported by their placenta requires serious very consideration (and nerve) – time will not improve the situation, only worsen it. Even spontaneous labour is likely to result in fetal distress once contractions start – these babies are already struggling. Pathological oligohydraminios is a serious complication. These factors may be influenced by the general well being of mother and baby ie. may occur if there are complications present such as diabetes, rhesus isoimmunisation, congential abnormalities, etc. But, usually no complication is present. Preterm birth – as the uterus become over stretched with fluid. ‘Unstable’ position of the baby – the baby can float about into helpful and not so helpful positions. Cord presentation or prolapse – because the baby is floating about the cord can get between his head and the cervix. Placental abruption – may occur with a sudden change in fluid volume and therefore size of uterus/placental site. Tests may be suggested to see if a cause can be identified (although nothing can be done at this point). Induction of labour with a ‘controlled’ artificial rupture of membranes may be suggested to manage the risk of an unstable lie and/or cord prolapse. This involves breaking the waters whilst holding the baby in place… and with quick access to theatre as the procedure can result in a cord prolapse. Alternatively, the woman may choose to wait until labour begins, and assess her baby’s position once contractions have started. Either way – the risk is the woman’s therefore she must be the person to decide which risks are best for her – induction or waiting. The exact mechanisms involved in regulating AFV are still unknown. AFV reduces significantly after 37 weeks – this is normal. There are no accurate methods of measuring amniotic fluid. There is no agreement about what measurements indicate ‘high’ or ‘low’ AFV. The intervention used to manage polyhydramnios or oligohydramnios ie. induction also carries risks which need to be taken into consideration. So, as you can see this topic creates more questions than answers which is why I previously avoided it! Science & Sensibility – What is the evidence for induction for low amniotic fluid in a healthy pregnancy? This entry was posted in birth, intervention, pregnancy and tagged amniotic fluid, ARM, birth, induction, intervention, pregnancy, risk, syntocinon. Bookmark the permalink. 151 Responses to Amniotic Fluid Volume: too much, too little, or who knows? If they were genuinely concerned due to the baby’s heart rate then induction is a strange decision – it is known to be associated with abnormal heart rate patterns. Something I’ve often wondered about and not seen addressed is the question of time. Since AFL are not fixed, yet able to change, how long would a woman need to have Oligohydramnios/Polyhydramnios to receive a diagnosis? If she presented for a prenatal appointment and this was suspected, yet there were no other indicators of a problem- not even high blood pressure, would you see her again the next day or two before diagnosing a problem? Wouldn’t it be reasonable, if she presented with Poly, to examine her nourishment and activity, maybe suggest diet improvements and light exercise. Therefore, building up her osmotic pressure and moving her lymph fluid, then reevaluate. In my area, I have seen the low fluid diagnosis happen quite often, usually the high fluid question is raised by medical students and proven to be nothing. Thank you for this well presented information. It would depend on the severity. With extreme poly or oligo I would offer a referral. With minor I would perhaps review. To be honest – if it is clearly detectable via palp then it is probably more severe. Still bitter about my first induction for “low fluid.” Thanks for exploring this because hopefully someone in a situation similar to mine will feel more empowered than I was at the time. Thank you so much for this information, I always knew instinctively that my baby was well at 42 weeks gestation and there was never anything wrong with the fetal ctg, however the public hospital where I had booked in as a back-up for our home birth used the scan for asserting amniotic fluid amounts to pressure me into agreeing to be induced the next morning. I realise that I was extremely lucky to have experienced a beautiful homebirth instead of a repeat hospital trauma. If I had refused to be induced the next day the hospital would have reported my midwife despite the fact that my baby and I were doing fine! Sent from my HTC Incredible S on Yes Optus network. I was diagnosed as polyhydramnious at 41 + 5 with my second child after a biophysical profile. I was in a homebirth program (fabulous homebirth with my first) and the back up hospital was able to over rule homebirth based on the results of the ultrsound (that I should never have said yes to! I knew they were unreliable at that point of pregnancy). I was above the graph for my gestational point and they freaked out. Plus the measurements of the baby predicted an almost 5kg baby. The recommmended course of action (after telling me all the things listed in this blog as dangers) was an induction the following morning. I went home and labour became established. I had to go to the hospital for the birth (the homebirth program I was in is becoming more and more regulated) and 47 minutes after I got there my baby was born. No missed gestational diabetes, no hypoglycaemia, no weird body formation, no cord prolapse, water broke 10 minutes before birth, baby was 4.25kg and perfectly healthy. To read this blog and know that there was no scientific reasoning for overruling my homebirth and leaving me with birth trauma to deal with (the birth itself was stlll fabulous but I carried a lot of anger about the fear I was given to deal with just hours prior to birth and all for nothing). Not surprised, but still makes me angry right now!! Thanks for this post. In my second pregnancy I was diagnosed with polyhydramnios at 33 weeks. My midwife felt there was an abundance of fluid on palpation, I was measuring 38cm, and then had a scan by an obstetric registrar which showed an AFI of 31 with a maximum pool of 10cm. I had suspected there was a lot of fluid because the baby was moving about very freely and my tummy skin had become crazy tight and itchy. The next day I had a formal scan and this showed an AFI of 21 with a maximum pool of 7cm! That is quite a difference – surely operator error should be less than that hey! Anyway the baby was growing normally, umbilical flow was fine and I passed a GTT, even though I had passed the routine GLT. So it was all a lot of worry and fuss that resulted in nothing different being done in regards to my care. I know that checking these things is sensible, but based on your post it does seem like a flimsy measurement to tell us how the baby is doing. I delivered my little boy at 41+2wks, 3915g, no PROM or any of the complications I’d been warned about. It would seem that some women just grow luscious babies in lovely big swimming pools of fluid!! I suspect the suspicion of oligo/polyhydramnios is as harmful as the suspicion of a large baby http://evidencebasedbirth.com/page/2/ , and that the suspicion may be more harmful than the actual oligo/polyhydramnios especially in mild cases with no underlying pathology. I think therefore blanket management is inappropriate as each woman needs care provided based on her individual situation. I went in for a BPP at 41.5 weeks and they found my AFV to be a 3 or 4. The doctors were adamant that I check in immediately for an induction, but I knew enough to be wary. My husband and I resisted, and went home instead to read up on AFV. After doing our research, we were still extremely uncertain, but decided it would be best to refuse induction after all. (I had an otherwise uneventful pregnancy and the baby seemed fine.) We were very turned off by the doctors’ approach: they continued to use the threat of a “dead baby” and suggested that I was only being selfish in refusing induction. Even the midwife couldn’t understand why we would refuse; everyone believed that the baby was in imminent danger. We were terrified, but felt that induction had its own pitfalls. We didn’t trust the doctors because we know how induction-happy OB-Gyns are. Still, we were panicked (until the healthy delivery 4 days later) that the cord might get compressed by the baby (and we would lose him, as the doctors were warning). Thankfully, the birth went fine, but to this day, my husband and I look back at that time with horror. We don’t know if we made the best decision — I mean obviously it worked out fine, but how much of a risk did we take? We would like to do a LOT of reading on the subject before having baby #2. Any suggested leads are appreciated. I enjoyed the article, and everyone’s comments! Hmmmm the concerns of the doctors seem strange. If they are worried about the risk of cord compression why would they suggest an induction (ie. more powerful contractions/squeezing) as an answer? Also, if OBs are so worried about cord compression why do they perform so many artificial ruptures of membranes (https://midwifethinking.com/2010/08/20/in-defence-of-the-amniotic-sac/). In your case even IF there was ‘low’ fluid there was most likely more than if you waters had broken… and plenty of women labour with their waters broken – or have them broken during labour. So, the cord compression theory does not make sense. The concern with pathological oligohydramnios is the function of the placenta ie. the lack of fluid is a symptom or a poorly functioning placenta. Was your baby well grown and moving? From your description it seems that you were being coerced into an intervention to meet the needs/wishes of practitioners. I wonder if the risks of induction were also explained (https://midwifethinking.com/2010/09/16/induction-of-labour-balancing-risks/) to assist you with your decision making? My wife is 33 weeks pregnant. She had 2 ultras this week, and the readings were the same: 5.5 cm AFI and one pocket that was over 2×2. The baby is breech. The baby is also normal size, organ development. There is no visible issue with the kidneys or bladder. The Dr. wants to give the baby betamethasone, then induce and C-section THIS WEEK. We declined. What are your thoughts on the chances of death or mental problems due to cord compression over the next 7 weeks if we go to term. Oh yeah, and our midwife has now dropped us. I can’t give individual advice. I’m sorry that you are having to work through this ‘change in circumstances’. If the dr is suggesting the baby needs to be born prematurely I am assuming the baby is in imminent danger… ie. they have assessed the placental function via umbilical artery doppler and are concerned. Low AFI alone is unlikely to create this amount of concern. I’m guessing the worry is not about cord compression as women labour when their membranes have ruptured and when the membranes rupture early (pre-term) everyone waits for the baby to mature before intervening. The worry may be about placental function. I suggest you get your dr to clarify exactly what the concerns are and based on what. Your midwife should be supporting you and providing information during this stressful time. What preceded the ultrasounds? What were they looking for? I had suspected something wasn’t right early in my pregnancy as I was showing rather early and seemed quite large for my dates. My concerns were dismissed as trivial and vain by the midwives and doctors and I was given an information sheet on diet and nutrition. I was eventually diagnosed with Poliohydramnios at 6 months after my full anatomy scan and monitored quite closely after that and referred to specialist care. Lots of investigations revealed my baby was healthy but the excess fluid was increasing. By 7 months I was admitted to hospital because of the risk of early labour and given steroid injections to strengthen my babies lungs incase I did deliver early. After 4 weeks confined to a hospital bed I was going nuts and begged to go home. I was allowed home at 8months on strict instructions of bed rest and being told that I could go into premature labour at any time and the risk of cord prolapse was extremely high and a medical emergency and to get to hospital ASAP at the first sign of labour. I was terrified that I would go into an early labour and didn’t dare to even walk to the corner shop and pretty much stayed confined home and to my bed. My only reassurance was “your baby is fine, it’s just that you have too much fluid”. The cause was idiopathic which is just a fancy word for I don’t know. At 37 weeks I attended my specialist appointment and was elated to be told that I needed to deliver immediately as my uterous was the size of a 2 week overdue woman carrying twins! It certainly felt like it too! I was booked in for a final scan and induction. I was so excited and relieved, I had successfully held on and carried my baby without going into early labour and my ordeal was soon over! The last thing on my mind was concerns about interventions or induction etc. I was about to deliver a healthy baby finally! I attended my scan at 37+3 weeks knowing i was about to have my baby. The sonographer noted my obvious fluid levels which were still excessive and then became very quiet before telling me there was no heartbeat. I wasn’t concerned, the baby was still breathing right? Looking back that was a silly thing to think but I was in complete shock. I went home that night preparing myself for the very worst. I was scheduled for induction the next day to deliver my dead baby. The labour was beautiful and easy and my grief and devastation was unimaginable when I held my son in my arms. My ordeal did not end there, I lost almost 2 litres of blood overnight and was rushed into emergency theatre. I almost died and by some miracle and medical intervention, I didn’t. I can’t help but think the irony is I was so scared of an early labour and determined to carry my baby to term but if I had delivered early or been induced just days earlier I would have my son now. Abnormal fluid levels should be taken seriously and I am at a loss to understand those who find interventions upsetting and dismiss medical advice. The most important outcome is a healthy baby and it was not that long ago that we did not have the advances in science and medicine that are now available and baby and mother mortality was high. I am all for having as natural a birth experience as possible, but if this is not the outcome, there are worse things that can happen. Even though things did not go as planned the last thing I was grieving was not having a water birth or being induced or having emergency surgery etc. Really it doesn’t matter, it’s the outcome weather good or bad that matters. Remember the hypocratic oath that health care providers take “first do no harm” and this may help you understand and appreciate treatment and advice that is offered to you. Thank you for sharing your experience and I am sorry that lost your baby. Extreme polyhydramnios is not normal and should not be ignored… more importantly, your concerns were trivialised rather than listened to. It is so difficult with the power of hindsight. I am guessing your care providers were waiting until 37 weeks to induce because of the risks to the baby of a preterm birth… no one could have anticipated that those few days would make such an enormous difference. I agree that the way a baby is born is not the most important outcome. Thank you again for sharing. I was very confused about the urgency applied to my babies delivery and started to question more and more if all of the ‘nastiness’ could have been avoided……I was asked several times by staff whilst in special care, why my baby was born early? This hightened my suspicion and so I applied for her notes…..Baby noted after birth as NOT IUGR (intra uterine growth restriction) on paperwork on several occasions……As this was also given for the reason that I had to have an ealy section (along with oligohydramnios)…..I was, ofcourse devastated and I tried to complain etc but was told they could only go by what the scans had told them and they had to adopt a ‘safe rather than sorry’ approach…. I took it no further…not sure now if I should have or not!? No body ever talks about 42 weeks plus. And no due date wasnt wrong. What do you do when midwife tells you to go to hosputal to have baby? You all focus on spontaneous labor, but what if labor never starts? And after it is all done, the placenta showed it was “dying”, it was old, baby shows up looking old because he is so late. Where are these articles? Oh, and your fluid is low, the midwife, ultrasound, all that even babies movements point to low fluid. Babe needs to be born equals induce. If oligo is there anything a mom is able to do (such as drink more water or certain tea) to increase AFV? Hi my wife is 38 week pergnant , when we check the AFI is 4. But all the things are fine. And my wife is also health and she didnot have any small problem. But doctor is suggesting for seisserion, we are in confusion. Pls give some suggestion. My wife age 21. I cannot give specific recommendations or suggestions for individuals. Your doctor should provide very clear reasons for suggesting a c-section in order to gain consent. Perhaps ask him/her whether the baby is in danger and why. Hi,My wife 24wk prgnt. On dt.21/12/2013-AFI – 16 and On dt.05/1/2014 AFI -20,Our doctor said that is polyhydramnios and problems in future what shall we do? According to the definition of polyhydramnios an AFI of 20 is not polyhydramnios. There is nothing that you can do at the moment except continue to monitor the situation. The fluid may decrease as the pregnancy continues. This would be dependent on so many factors. A reduction of AFI is a dangerous medical procedure and should only be performed if the baby is in danger ie. very rarely. i need some advice or help…..i am 33 weeks pregnant. i went to see my dr monday bc i though i had leaked water so she did a sono and had seen that my afi levels were at a 6.8. she ran a test to see if my water had broke but it came back negative. she had me come back wed. to check afi levels again, now it is at a 5.5. she is saying the baby looks very healthy, i had the steroid shots two weeks ago and she is going to give them to me again to make sure. i am really nervous and just wondering what happens if my levels go under 5.5 tomorrow when she checks me.? Hopefully they will do nothing if your AFI levels are under 5.5 and your baby is well. It would require a very compromised baby to justify any action at this point. I am surprised that your dr is not fully informing you about what they are looking for and what action would be proposed if x or y happens. Communication and information sharing is very important. Now, her face is like polished glass, especially on the forehead. compromised, Hathaway’s character is the only which can proceed alongside the main character since the surgery has helped her continue to conceal her identity as a spy. Have you written any blog posts about the necessity of women with gestational diabetes to be induced if they pass their 40 week gestation mark? I am 38 weeks 4 days along and have gestational diabetes, my midwife just informed me that if the baby is not born by my due date that we will need to discuss induction. I am feeling skeptical but do not have very much information about whether this is really necessary. Thank you. I haven’t written about GD yet. With abnormal blood sugars (ie. uncontrolled GD) there is an increased chance of stillbirth in the last weeks of pregnancy. That is why the usual recommendation is to induce before term. However, this risk is directly related to blood sugar stability and a woman with GD and normal blood sugars is at the same risk as any other woman. I am 33 weeks pregnant and my OB measured the fluid at 6.5 two days ago and then today got a measurement of 7.9. OB is forcing me to come in two times a week from now on to have this fluid monitored. Told me if it gets to 5 they usually take the baby. Told me about dangers of cord compression due to low fluid. I REALLY wanted to try to have this baby at home so I’m wondering about a couple of things. How low is too low and can I still aim for home birth? OB says this fluid “almost” puts me as high risk, yet there are no other issues at all with pregnancy or baby other than he is a bit smaller than we thought he’d be. My first pregnancy two years ago was very healthy and produced a very healthy 8lb. boy. At this point in that pregnancy that baby was in the 85th percentile for growth. Right now this baby is in the 20th percentile. Is this fluid related? He seems very healthy, just small. Also, with first baby my water broke then I went on to labor for 21 hours. So even if my fluid is on the low side right very near time of delivery and even if water breaks at beginning of labor lowering fluid levels even more so is it life threathening to baby to proceed with home birth? Your fluid is low for your gestation. The fact that you previously had a good size baby and this one is small (if estimation correct) is another concern. These two factors may indicate that your placenta is not functioning as well this time. Did you have an assessment of placental function (see post)? Your OB is concerned that you have pathological oligohydramnios. Cord compression is not the only risk in labour if this is the case… many women labour after their water has broken = less fluid. The main risk is fetal distress once the placenta starts being ‘squeezed’ with contractions. Please read the information on pathological oligohydramnios in the post. The low fluid and small baby may be symptoms of problems with the placenta. If this is the case you may want to reconsider your birth plans. It would be great if you could return and let us know what happens. Hi, I wanted to come back and let you know what happened. After a couple more weeks of seeing my OB twice a week to measure the fluid I decided it was pointless. My fluid had gone back up and was staying at 9. I believe it had only dropped temporarily due to a recent virus I’d had. I concluded my OB was handling my case as a “potential problem” when it clearly wasn’t. Very late in the game at 36 weeks I left the OB and started care with a wonderful and wise midwife. I had a wonderful labor and very easy and fast delivery at home three days before my due date. Baby weighed 7lbs.4oz. and was 20″ long. A very healthy and strong baby. At one month weighed 11 lbs. and almost 22″ long. Absolutely no issues whatsoever with labor, delivery or baby. I am so glad I trusted my body, my midwife, and God and opted for a normal delivery in my home instead of allowing the OB to make me fearful of any and all potential what-ifs that could have been. The female body is amazing and low risk pregancy, labor and birth goes best when not interfered with. I found that pain meds and other hospital interventions are far harder on the body than natural childbirth. As soon as the baby was out I had not another single second of pain. Never took anything not even ibuprofen postpartum. Also, not having to birth laying down on my back (hospital style) allowed for an easier birth with no tearing this time! I felt great afterwards! Home birth and midwife care was a wonderful experience!! Hi Lesa, my wife is also at 30 weeks and has AFI of 5, everything else being normal in BPP. Was wondering if her AFi could go up. What did you do to increase the AFI? Did you take anything in particular? What was your lifestyle/day routine like? What’s your body build type? Are you generally a very optimistic person? Just trying to find parallels. Can you explain to me what is the risk for my baby and for me please and what i need to do? That is a very high AFI. Read the information in the post about polyhydramnios for more information. Your OB should be fully explaining the findings of assessments and what it means for you/baby. Ask him/her for a full discussion at your next visit – it is their job to do this. I hope all goes well for you. Thank you for this informative post! I was diagnosed with oligo when I was 36 weeks pregnant with my daughter (now a healthy 2 year old). My AFI was 3 cm, and I delivered her by c-section a few hours after diagnosis (she was breech). Oligo was discovered by chance – I was having a doppler scan in preparation for a version, to hopefully turn her. I wasn’t given any information about possible causes – they just told me to drive to the hospital for delivery. I am now pregnant again, and am feeling nervous, because I am wondering if the low fluid level shouldn’t have been caught earlier last time. I had a scan at my midwife’s office two days before delivery, and no mention was made of low fluid. I had been measuring 2 weeks behind in fundal height for about 6 weeks. My daughter’s head was easily palpable on my belly for a week or two before diagnosis. No one ever mentioned the possibility of low fluid. Should I push for more careful monitoring this time? Or are these situations usually a fluke? I can’t help but wonder what would have happened if I hadn’t had that last optional ultrasound at the MFM. It depends on why you had oligo the first time as to whether it is likely to happen again… and you may not know. Usually it doesn’t happen again. If you would feel reassured by increased monitoring this pregnancy then that is what you should push for. Can you discuss this with your care provider? If they know this is something you are concerned about they should be able help you with it. Very interesting article and for once one that is understandable. I am currently 34 weeks and 3 days pregnant and I had a scan by chance yesterday as I thought my waters had broken, which they haven’t. The scan is showing high level of fluid and the deepest pool is 9 cm how severe is this? They also said that baby’s bladder was full with a longitudinal of 6 cm, they did another scan after about 30 mins and the bladder measurement had gone down to 4.8 cm. Could you please tell me if this is a case of Polyhydramnios? The baby is growing fine otherwise. I am already booked in for a planned C-section as I suffer from arrhythmia, I am really concerned if the high levels of fluid are harmful for my baby. I have to go for blood tests on Monday to check that I haven’t developed diabetes or an infection and then go back to my consultant in 2 weeks for another scan to monitor the fluid levels. Is the level of fluid too severe as I am going to be stressed for the next two weeks now. I can’t tell you if this is polyhydramnios… not sure what your AFI was and I don’t have access to your findings or full history. It always interests me that women who have cardiac issues are recommended to have planned c-sections… I can’t imagine how an operation is less stressful to the heart than a physiological birth. Thank you so much for this article! I am 36 weeks pregnant and have been recently diagnosed with polyhydraminos (AFI of 28), and am in the process of undergoing testing to attempt to identify the cause. This was the most reassuring article on the subject I’ve found online, especially the explanation of the risks and the possible complications. I’m glad that my doctors are looking so hard for a cause, but also knowing that no matter what they find I can expect the rest of pregnancy to continue roughly the same as it would have before the diagnosis is very helpful. Thanks Hilary 🙂 It would be great if you could come back and let us know what happens. Women’s experiences are really valuable to other women in similar situations. Low fluid does not cause stillbirth but is an indication that the baby has insufficient oxygenation from the placenta… and the reason for that may be unknown. It is unlikely that low fluid would suddenly occur over 24 hours, so an ultrasound would probably detect it. If it was detected then a medical review would be required to determine the best course of action for the individual in the individual’s circumstances. Hello, I am 31 weeks pregnant. Yesterday I ha a Doppler and the AMFI is 8,8. Is this too low? I was prescribed to drink lots of water and rest as much as possible. Nobody has explained what is as much as possible. Should I bed rest or just take it easy. I have two daughters and I would love to be able to do things with them especially that now it is summer. We already cancelled our holiday plans but I am not sure exactly what I have to do. Baby is growing fine and there was no mention of any problems with the placenta. I would much appreciate your advice. Is the AMFI the AFI… or is this a different measurement? An AFI of 5 or less is considered oligohydramnios (too low). It seems that your care provider has not adequately discussed your situation or their recommendations with you. I am unable to comment as I am not providing your care and do not know your entire history etc. Can you make an appointment to clarify what they mean? There are risks associated with overhydration. I am a little confused as your AFI is not ‘low’… and drinking too much water i.e. over 2 litres is not good… Your baby seems to be healthy and growing well with no concerns re. placenta. I’m sorry – I can’t shed any light on your situation as it does not make sense. I am currently 40w 4d pregnant with my first baby, a boy. Yesterday I went to see my midwife and for the second week in a row she found my fluid to be borderline low, an AFI of a little over 6cm. As per her recommendation and routine procedure, I am getting a BPP done tomorrow morning. My midwife seems to be confident that everything is fine. I have had a very healthy pregnancy so far. Just wondering a couple of things–should I be worried? Can I refuse to be induced? How far should I be willing to take this pregnancy before labor begins on its own? I am not sure how your midwife is measuring your AFI… ultrasound? What did your BBP report? Yes you can refuse to be induced under any circumstances. How far you are willing to take this pregnancy is your own personal decision and your care providers should share information with you and discuss your options with you. It is impossible for an ‘outsider’ to do this for you. I hope you have had your baby – let us know what happened. Thank you for your response! No, unfortunately I still haven’t had my baby at 41w2d. My BPP was great, actually, I had no need to worry. His AFI measured around 9.6cm, so I guess my midwife’s ultrasound machine is not very accurate and caused me to worry for no reason. He got an 8/8 on his BPP. My midwife suggested taking castor oil this weekend, since I’ll be 42 weeks on Sunday. I got my second membrane sweep yesterday and had mild, 20-30 second contractions (felt in my lower back for the first time) for a couple of hours last night. They went away. I woke up this morning and had some blood on the sheets. Not sure if any of this was indicative of any progress, or just my cervical check/membrane sweep. Either way, my baby has descended to almost a 0 station which is great progression from last week, and my midwife also dilated me to 2cm and said I am 50% effaced. There is the update on me!! Going for another BPP today. NST yesterday said he is doing great in there. I am not so worried anymore, just anxious at when he will finally make his arrival!! Thank you again!!!!!! 3 1/2 years ago, my OB induced me because at 39w3 days, my AFI was 29. I did not have GD and my baby girl was born 3 days later, the induction did not work and I had to have a c-section. She was a healthy but very big baby, 9 lbs 12 Oz and 22 1/2 inches. Now I’m pregnant with my second, and because I’ve felt the baby move a lot since very early on and because my belly feels tight, I’ve suspected all along that I have too low amniotic fluid, also just a gut feeling. I asked for it to be checked at my anatomy scan but they said it was pointless to do so then. I had an U/S at 32 weeks (because I’m considered AMA at 36), and the fluid came back at 9.50, baby measuring fine. The doc said that was a good level. While it is OK, I’m concerned that it will start decreasing soon (I’m 34 weeks now), and that by 37-38 weeks it will be very low. From all that I’ve read fluid decreases near the end of pregnancy. I’m scheduled for a repeat C-section at 39w2d. I’ve asked my OB to have my fluid checked again but she says it’s not necessary. Should I keep pushing for more testing in the upcoming weeks? I’m also concerned that for one pregnancy I had too much fluid and now it’s not low but it’s at the bottom of the normal range. I feel my doc is just too hands-off as far as testing goes. Am I worrying for nothing? Thanks! You OB should be able to assess fluid fairly well during abdominal palpation. Oligohydramnios if pretty obvious when palpating. I’m 38.5 and went for a BPP yesterday (I have epilepsy so they’re doing these weekly). I was alerted my fluid level is at 26. I was told not to worry as everything else seems fine, and has been great all along. I use a midwife practice so they really don’t like to use interventions unless necessary. I have of course researched now and have myself absolutely terrified. I wanted a natural birth with no medical interventions, and my midwife said this can still happen, I’ll just need some pitocin after the birth. The midwives and even high risk OB don’t seem too concerned, what are your thoughts on mildly high levels in late pregnancy? I failed to mention to them that I had a lot of water (more than normal) preceding my ultrasound. mildly high might be your ‘normal’. Your care providers are not concerned and they have ‘the full picture’ ie. how you and baby are doing. There is no reason that you cannot have a natural birth. I have just had a scan at 29 weeks and been told that I am polyhydramnios with a max pool of 8.2cm. Please can you tell me what this means and if this is high risk. I am very worried as I already lost twins at 20 weeks last year (not for this reason) and have now read about the risks of cord prolapse and placental abruption as a result of this condition. I cannot comment on individual situations – this is the job of your care provider – so please discuss this with them. Your fluid is only slightly over the ‘normal range’ (<8cm). This could change. The concerns about cord prolapse or abruption are related to labour or your membranes breaking – which is unlikely for another 10+ weeks. I am trying to understand AFI behaviour and impact ob baby. My case the women scan at 30wks showed AFI = 16.2cm. At week 34+5 she went to hospital due to slight blood found on discharge. During the routine scan her AFI was at 2.3cm. She was admitted to hospital and on rest. Baby is breeched and c-section was planned at 37wks as the baby is considered mature and this will reduce the risk of infection. But because AFI is returning to the normal index for that period there is consideration to delay c-section. Baby is active, heart avg. 140bmp. And seems not be highlighted and problems with baby. Placenta function is normal and ubilical flow as well. What could have caused such drop on AFI (16cm to 2cm)? Suspected from broken placenta causing leak.. but than we see a recovery on week 36. Second question. Could the low AFI period affected baby development? Third question: now that the AFI is slughly higher, us it same to assume that there less risk of infection? “What could have caused such drop on AFI (16cm to 2cm)? Suspected from broken placenta causing leak.. but than we see a recovery on week 36.” – not sure… perhaps inaccurate measurement? “Second question. Could the low AFI period affected baby development?” – if it was a symptom of IUGR yes, or if it was so significant that parts of the baby were compressed against the uterus eg. feet = may develop abnormal positioning. “Third question: now that the AFI is slughly higher, us it same to assume that there less risk of infection?” – not sure what infection has to do with low AFI unless the low AFI was due to the amniotic membranes being broken – in which case there would have been fluid draining. Thank you for this article. As a doula and Bradley teacher, one of the things I run into a lot working in a big city is women approaching 40 who are considered ‘high risk’ due to age, and being induced due to low fluids. It would seem as though there is nothing else indicating a problem, but because women over 35 get late pregnancy ultrasounds this gets picked up a lot and generally leads to induction and often c-sections. My question is, should age automatically risk you out of ‘ There is a lack of evidence supporting induction for oligohydramnios in ‘low risk’ pregnancies ie. when there is nothing else ‘abnormal’ going on with mother or baby’? Thank you! The only thing risking any woman out of anything should be her own decision. Statistically and generally women over 35 are at a slightly increased risk of still birth at the end of pregnancy compared to women under 35. We are talking about less than 1% here: http://www.ajog.org/article/S0002-9378(13)00534-6/abstract This general increase in risk is being used as an excuse to coerce women into inductions. Some need to be given information about the risks of continuing their pregnancy vs risks of induction (https://midwifethinking.com/2010/09/16/induction-of-labour-balancing-risks/) specific to their individual situation. They can then decide themselves which risks are more significant to them in their individual situation. Hi, I am currently in hospital 23 weeks pregnant wid an AFI of 5.they said its a ruptured membrane, On strict bedrest. Have had about 4 spontaneous bursts of red bleeding in around 3 mnths, which resolves thereafter. The deepest pocket of fluid was around 2.5 cm.baby according to ultrasound is 610g. I have had 3 previous c-sections, the last being about a year and a half ago.. I am told I most probably will go into labour and pass the baby out. But I am feeling baby move and have stopped bleeding. Womb is closed, no pain.am being monitored. Thoughts and advise pls? I hope all is going well for you and your baby. I can’t give you advice… only good wishes. I know women who have had ruptured membranes in early pregnancy and gone on to have a health baby. You will continue to make amniotic fluid and if the membranes reseal your AFI will increase. Also, is there any way to increase AFI? Hi, My wife is pregnant with 31 weeks. last week while U/S screening, she found AFI 24.1 cm. Not found any anamoly in baby. Heart beats are 142. Until last U/S (18th week) everything was normal. what could be the reason? what precaution we should take? Current DIPSY test (75 gm sugar test) was 136. Your wife needs to discuss this with her care providers as they will have all of the information about her pregnancy tests. I can’t give individual advice or recommendations. I hope she gets the care, information and support she needs. i am 38 weeks pregnant. I recently got an ultrasound scan done and the report says Polyhrdramnious with AFI = 23.5. The baby weighs 3.4 kg. Can you please advice if it is something i need to worry about? I am not diabetic. My previous scan at week 33.5 weeks dint show any such thing. I am unable to give advice to individuals. Can you discuss this with your care provider who should have a good understanding of you individual situation? 3.4kg is a good weight for a 38 week baby – but ultrasounds are not very good at estimating weight. Your AFI is not technically polyhydramnios according to general definitions which = over 25. You seem to be having a lot of scans ie. one at 33.5 and at 38 weeks – so I am guessing there are concerns about your pregnancy as routine scanning at these gestations is not evidence based? Hi, I’m 33+3 for the last couple of months my bump has been hard and I have been measuring just above my dates. I’ve also been having a lot of discharge for which I had swabs and they came back clear. Last week I booked a private scan as I had a feeling something was not right and I wanted assurance. I was told I have a lot of fluid and to contact my midwife. I did so and was refered to see my consultant. On seeing him today and having a scan my AFI is 26cm and deepest pool 11cm, I also have leu 2+ protein 1+ ery 1+ . I am booked to have a gestational diabieties test and if that comes back clear then they will monitor me as normal but no other action. Should more be done, should I be concerned, something doesn’t feel right with the baby and I lack confidence that they are doing enough. I would appriciate any advice or information. You should always listen to your intuition. However, there are no other tests they can offer at the moment, or action to take – all they can do is ‘monitor’ until something becomes abnormal. Discuss your concerns with your midwife ie. ‘that something doesn’t feel right’ – it sounds like you need some additional emotional support. Thank you for your reply. I haven’t felt like I’ve had much support of my midwife at all in this pregnancy so your probably right. However I don’t see my midwife again until I am 37 weeks which feels so long away, I also can’t contact her via phone as her phone keeps breaking. My consultant is aiming to get me to at least 35 weeks so if I don’t make it to 37 which I don’t feel I will then I won’t see her again at all. Hi, I went for my ultrasound at 19.3 weeks and my AFI was 8 cm… Since 16 week till 19 week I have ahead flu with fever, diaherrea and vaginal infection . The day I had my ultrasound I was taking medicine for vaginal infection and 3 days back my diaherrea had got ok. So could this be the reason for low AFI or there is something else . In the scan all the measurements were perfect. Heartbeat, kidney, urine flow and everything was ok. Your AFI sounds normal and will increase with gestation (see graph in post) – has someone raised concerns about it with you… or have you just read the report? If your baby is growing and developing well that indicates that the placenta is functioning well. Can you speak to your care provider about your individual situation and scan results? Both my ultrasound doc and my OB has raised concern… My ultrasound doc told me to be active an drink lot of water whereas my OB has told me to take bed rest for a week. So don’t know. What to do and how serious is it? If your OB is your care provider he/she will be the one with the full picture (scan report, history, etc.) and can provide you with information about what exactly their concerns are. You need to ask them to explain the situation to you. You need to consult with your care provider and ask them to explain the findings in relation to your individual situation. Hello there I was diagnosed with polyhydramnios a few weeks ago. I’m currently 37.2 weeks with a AFI of 32cm with the largest pool 11.8cm. I passed all the typical test and the reason is undetermined. We did notice that over the past two weeks I’ve my total AFI has jumped 10cm. Baby isn’t measuring very large and in the 61%. My fundal height is measuring 40.5 weeks. I’m starting to get worried over all the extra fluid. We are planning a home birth with a Midwife but ultimately I want a healthy mom and baby. Is this just wait and see approach okay? I am 12 + 4 weeks pregnant ( h/o previous 2 early miscarrages )Durig my first trimester screening fetal medicine doctor informed me about subjectively low amneiotic fluid with uper limit of normal umbilical artery resistance on NT scan.Other finding are well normal. As most of the post are later in gestational age, any one any idea about oligo early like mine? Follow up scan is planned on 16thweeks…I am nervous and stressed. I haven’t come across oligohydramnios being diagnosed so early. The chances are this will not be present at your 16 week scan. Hopefully a reader will have some experience with this. It would be great if you could come back and give us an update in case anyone else experiences this. It must be very stressful for you. Hi! I am 35+4 w/ AFI of 37cm. Baby weighing approx 7lbs 3oz. All seems to be developmentally normal. Measuring at 378 weeks. Should I be worried about birth defects or any other abnormailities? BTW, I am 39, h/o 2 miscarriages. It seems that all of the clinical assessments of your baby are reassuring. I can’t tell you not to be worried… worrying is part of becoming a mother. Can you discuss your concerns with your care provider? Hi, My wife 20wk twin prgnt. AFI -21,Our doctor said that is the problem and having much chances to do abortion what shall we do? is this curable? You really need to discuss this with your doctor and make sure he/she answers your questions and concerns. I am unable to comment on individual situations as I do not know the full picture. I’m 38 weeks n 2 days pregnant and my AFI as per my USG yesterday was 5. My doctor told me that this is pretty low and told me to get admitted to the hospital today. What is an acceptable level of AFI at this time of pregnancy?? My baby’s heart rate, movement and weight is all fine so far, but he seems to be in an oblique position with the head resting close to my navel. My doc is not inducing labour and suggesting me to go for a C-section. Is there any way that I can help turn my baby into proper position for labour? Is there any way of making the AFI better? I want to wait and try for a normal birth before I go into surgery?? I’ve not had any labour pains yet. I really can’t comment on individual cases as I don’t have your full clinical history/picture. Your doctor must be very concerned if he is suggesting admission to hospital. Are the umbilical artery dopplers poor? Have a look on the spinning babies (google search) for methods of encouraging baby to settle into a good position. However, there may be a reason that your baby is unable to get into your pelvis – and if the amniotic fluid is low there may not be a lot of fluid to assist with position changes. My wife is 37.5 wk with AFI 5. Our OB suggested induction on the next day, but we declined.. He scheduled for another scan 48 hours later. The meanwhile, I found your blog post and your information on AFI makes us feel better. Other than AFI, my OB cited another reason for induction is that the foetus has no growth between the scans 5 days apart (she remain 3.1kg). He cited the placenta could be losing its function. Other signs seems okay. Heart rate is 140. Foetus is kicking regularly. My wife is actually feeling good, and was totally surprised with the suggestion to induce. What do you think of the foetus growth remaining static for 5 days apart? Baby should be growing over a week. The umbilical artery doppler should be used to determine if the placenta is losing function – ask your OB what that test showed (assuming it was done!). Thanks. We had a doppler test today, and turned out the placenta and blood flow is fine. I would also like to share how we lost trust with our OB today. Here is the long story: I went for check up in the morning, and the AFI is 4.95 cm, and foetus is 3.2kg (there is growth). He still suggested going for induced labour, but we declined. He said going for c-section is another option. We still refused, and he referred us to a hospital to do a 1 hour doppler test. The result of the test: AFI 8 cm, foetus is 3.25kg, and the blood flow etc is fine. AFI 8 cm is low, but okay. We went back to our OB with the report, and he congrats us on the good news. Then he told us he will be overseas for the next 10 days, and we had to have the next check up with another doc. The trust was lost! How could he not have mentioned earlier!? An honest OB would have informed of his schedule that clashed labour period? We felt he had been pressuring us to induce because of his personal motives. There are other techniques he used to convince us to induce. And we were not the only one – we chatted with another mother and she was also with AFI 5 cm, and had to be induced that very day! I am glad we had the courage to say NO to induction. Unfortunately this seems quite common ie. and OB suggesting induction to fit with their own schedule – but not being honest about it. I am please you had the courage to say ‘no’ and stand your ground. I request you to please throw some light on the same. I am 24+5 week pregnant, and my AFI is shown as 20 in ultra-sound. Doctor told me that the fluid levels are little high. Could you please tell me what should be the ideal AFI index at 24+5 weeks ? Could you please tell me if my baby will be fine? Could you please tell me if there are any natural ways to control the fluid volume? I went in for an ultrasound last Friday at 33 weeks and discovered my AFI was 3.6 with SDP being 2.6. The ultrasound was actually ordered for other reasons but the AFI was the most noteworthy outcome of the procedure. The Dr gave us the option of going home and coming in twice weekly for stress tests/ultra sounds or of going to the hospital. She mentioned one of the major risk factors being cord compression. At first we were going to choose the home option, but it was actually our midwife (we were planning a home birth) who felt that the hospital was the safest given how low my levels were and the risk of cord compression. I’ve now been in here 4 days, drank tons of water, but today’s ultrasound showed stable fluid levels, no increase. The baby’s growth is spot on, good variability with heart beat, decent movement. No one at the hospital is pushing me for delivery now. Everyone is on board with trying to ride this out to 37 weeks if possible. However, my Dr feels I could go home rather than remain in the hospital. My question comes about leaving the hospital and transitioning from 3 x per day stress tests to 2 x per week stress tests. I don’t believe these stress tests have a long “shelf life” and since my AFI has not improved, the same cord compression risk exists for my baby now that it did 4 days ago even if all other vital signs look good and reassuring. I don’t really want to stay in the hospital but I’m not sure why it’s safe for me to leave now if the very factor that had me admitted remains unchanged. I hope that makes sense! Have you discussed your concerns with your Dr? She/he will have all the information from the various test and should be able to explain their recommendations to you. Low fluid levels are a concern because they can indicate problems with the placental flow. Presumably you have had umbilical artery doppler tests that do not = concern regarding oxygenation of your baby. Perhaps they think your oligohydramnios is not a symptom of poor placental function? In regard to cord compression – this usually occurs during labour when the uterus ‘squeezes’ the baby and cord… not in pregnancy. Thanks for responding so quickly. I am speaking to my Dr this morning but just wanted to seek out your thoughts as well. Yes I believe I had the umbilical artery doppler yesterday with my ultrasound (I think they called it something slightly different) and it looked fine so at the moment they are not concerned about placental function. Thanks for your comment about cord compression risk during pregnancy vs during labour – I will raise that question with my Dr. In your experience, have you seen someone with quite low levels be able to at least maintain status quo for a number of weeks or is that unlikely? I was really hoping intense hydration would help but over the 4 days it didn’t really do anything so it seems that is not the underlying problem though perhaps there will be a difference by Friday. On a completely separate note, baby is breech and I am hoping to do Webster technique on Monday but it sounds like with such low levels my chances are slim? Thank you for your thoughts. hello i have weekly nst/afi because of a bmi of 31.I had a dna test at 14 weeks and the results came back normal. As of today I am 36 weeks. my afi tests results over the last few weeks are as follows. 16, 30,23,23,31. My dr does not seemed concerned at all and says it proves it is not a exact science. I know i need to trust him and be confident but i have read the possible complications and am terrified. I can not get relaxed. What do you think of these numbers and my drs reactions? thank you so very much for what you do. Your doctor has access to more information about you and your baby. I am guessing he is using his clinical judgement rather than just the results on one test. Hi there! I’m pregnant with twin boys. They are in different sacs, and their placentas are fused together. Because that was caught on a growth scan at 20 weeks, they’re not entirely sure if it’s one placenta or two, but are leaning towards there being two. At 24 weeks my SDP in both sacs was about 10cm and I was told to get my GD test to rule that out. Both babies are big, one is bigger than the other (I can’t remember their measurements at this time). GD was ruled out in the meantime. At my 28 week growth scan, my SDP was still at 10cm. I had a blood test done and a scan by an MFM to rule out Down Syndrome at my 20 week scan (I did the blood work at 14 weeks, but I know it’s not the most accurate tool when you’re having twins). At first my MFM seemed concerned that my SDP was at 10cm, but since it didn’t change in a 4 week period, she seems less worried. The twins are also big for their gestational age. At 28 weeks, twin A measured 3.5lbs, and twin B measured 2.75lbs. My question is, are there different measurements that should be considered when measuring the individual sacs of twins? Even though both twins have excess fluid in their sacs, their size difference is a bit concerning to me, especially since they can’t rule out that they may be identical. Should I be worried about this and bring it up at my next appointment? Since both twins have excess fluid, is this an indication for an increased risk for their being an abnormality? I will ask these questions at my next visit. I’m just hoping to get some insight based on your experiences in the meantime. Thank you. Congratulations on your twins! Twins are complicated, and to be honest not my ‘area’ of expertise. If there were any major concerns your care provider would have let you know already. I’m sorry I can’t offer any insight. I’m sure your care provider can answer your questions and give you specific information about your situation. AFI level : 10.2 cms in 37.1 week is it OK or worriedable ? You need to ask your care provider who will have all the information about your individual circumstances. You need to discuss this with your care provider. I am unable to give individual advice on this blog. AFI is a measurement in cms (pockets of fluid) rather than weight of fluid. You need to discuss your concerns with your doctor. Low amniotic fluid and high BP can be a sign of pre-eclampsia. Perhaps this is why your doctor is suggesting an induction? You need to discuss this with your care provider. Any assessment needs to consider the individual circumstances/situation. Wow!! Great article, congrats!! May I translate it into Spanish in my blog? And of course, mentioning this source. Thanks!! Hi. I’m 35+3 I have had a rough pregnancy so far I have an anterior placenta n don’t feel baby move so I’ve been having daily ctg weekly dopper scans n fortnightly grow scans. Babys belly is growing slightly smaller then rest of the body. Over the weekend I had a fall down the stairs n was loosing a yellow liquid i went to labour ward n baby was monitored n was fine they wasnt bothered about the leakage. Yesterday 35+2 I had my weekly doppler n this has found I have an afi of 2.3. Ive been given my 1st steroid injection n have my 2nd today they checked cervix this was closed n no waters leaking yesterday. I’m also on a course of antibiotics for 10 days n have a repeat doppler on Thursday. Can someone please reassure me that my baby is ok they said blood flow is ok through cord I’m just really worried due to the problems I’ve been having. You are being closely monitored by your care providers and they have told you that your baby has a good blood flow through the cord. It must be very stressful for you. The chances are that your baby will be fine but no one can tell any mother for certain that her baby is/will be OK. I send my best wishes for a good outcome and hope that you have good support around you at this time. You need to discuss this with your care provider who will have an understanding of your entire clinical picture. I am unable to provide advice to individuals. In your experience, are there any proven methods (beyond drinking water, eating healthy and resting) to increase AFI levels given that all other BPP indicators are normal? Are there certain medications that lead to decreased AFI (ACE inhibitors, iron, etc)? Are there proven methods to inject fluids directly to increase the AF, and does that create a better environment for the baby to grow? All research worthy questions but just asking in case you have some empirical evidence. I am not aware of any research demonstrating the effectiveness of any particular intervention. Thank you for sharing this article. Im 34 weeks pregnant now with AFI 9.1. I was diagnosed with oligo with AFI 7.2 during 32 weeks and doctor has suggested Astymin intravenously and advised weekly checkups to monitor fluid levels. At 33rd week AFI was 8.56 and again suggested Astymin. This week it is 9.1 and again used Astymin to increase fluid level. She said I will complete 37 weeks by june 25th and I can plan delivery soon after that. Till then she said it is important to maintain fluid at 10cm or above. Dr said baby is doing fine and I only find that baby movements have reduced ever since I started to have low AFI. Movements started to improve as the AFI increased from 7.2 to 8.56 to 9.1 for the last three weeks. I had a cyst on left ovary for 3 years and after making some changes to diet and medication I managed to get pregnant. I also have bicornated uterus. Doctor was giving high risk pregnancy treatment. Also I had incompetent cervix at 13th week and Dr. used Mc Donald knot method to put a stitch to treat cervical shortening. Im positive that fluid level went low due to low intake of water. I take 2ltrs per day. Please advise if I should increase this. Also i have taken 8 bottles of Astymin intravenously per week. Hospitalised for two days per week for the last three weeks. Which means 24 bottles of Astymin till now. One reason Dr suspected for low AFI is overgain of weight im 79kg now I used to be 63kg when I was initially pregnant. I have no control on weight gain no matter how well I plan my diet. Considering low AFI, cervical shortening, bicornated uterus and weight gain in my case, can I plan for natural birth? Is it really the case that I should go for a c-section? Baby weight is 2265gms now (34weeks). Please advise if it is safe to plan natural birth. Thank you in advance. Hi i am 35 week pregnant and had n ultrasound yesterday,my doctor said that the presentation is cephalic ,normal cardiac activity,normal fetal movements bpd is 90 mm fl is 66 mm placenta is anterior,liqour is 20 cm AFi impression is single active fetus at 35 weeks of gestation however impression is also marked as polyhydrmnios …….after reading articles and consulting different care takers i was told that afi value beyond 25 is prblm at this stage ……but m highly depressed with 20 cm also …kindly guide me waiting for the prompt respose. It is outside of the scope of this blog to provide individual advice or recommendations. You need to discuss your concerns with your care provider and ask them to explain anything you are unsure of. I m 31 weeks pregnant n my amniotic fluid index is AFI-8.5 n m very tense is it very low? Just wondering I had scan at 20w and they said everything looked normal but could not get good measurements so had to go back at 22w 5d and at that scan the lady was worried about how much fluid was around baby. She believed it was 4cm. I have another scan then meeting with baby specialist this Friday. I’m trying to stay positive but it’s very hard having to wait a week between scans and not knowing anything yet. Has anyone ever had this? Please discuss your situation with the care provider who ordered your ultrasound scan. I am unable to provide individual advice.